Richard Clayderman (born Philippe Pagès) is – according to The Guinness Book of World Records – the most successful pianist in the world. One of contemporary music’s premier instrumentalists, his albums routinely sell millions of copies, with concerts invariably selling out months in advance. 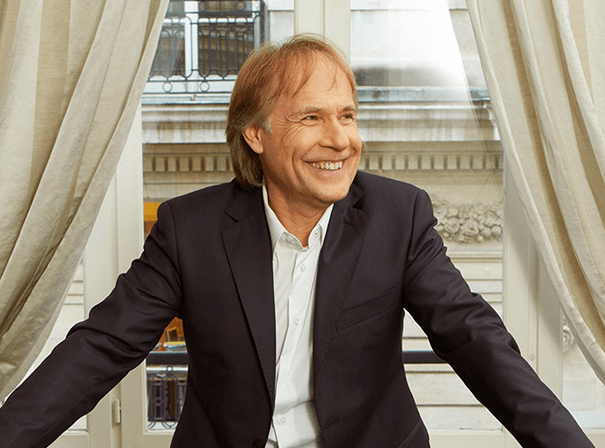 Clayderman’s signature romantic style, combining trademark originals with reinterpretations of classics and pop standards, has helped him sell over 150 million records and release 70 phenomenal, platinum-selling albums. Instructed in classical piano by his father, Clayderman joined the Paris Conservatory of Music at the age of 12. Despite his classical background, Clayderman moved into popular music when he launched his professional career. The pianist’s debut album, Ballade Pour Adeline, sold more than 20 million copies and was distributed in 38 countries: since then he’s amassed a vast discography of well over 200 albums, released across many different labels worldwide, that’s seen him record everything from light interpretations of classical favourites, to Andrew Lloyd Webber love songs, Bollywood movie soundtracks, ABBA covers, and the folk music of Turkey, Germany and Japan. While this eclectic approach has undoubtedly fuelled his worldwide popularity, it is the saccharine charm and instant accessibility of his output that has earned him a loyal, and considerably broad, fanbase.